So far, during this holiday my boyfriend has honestly taken me to the most beautiful places; growing up Poland was never high on my list of places to visit, I'll admit but having seen places that I'd hadn't even heard of my mind has definitely changed. I want to see so many more things that I'd never thought of before now... 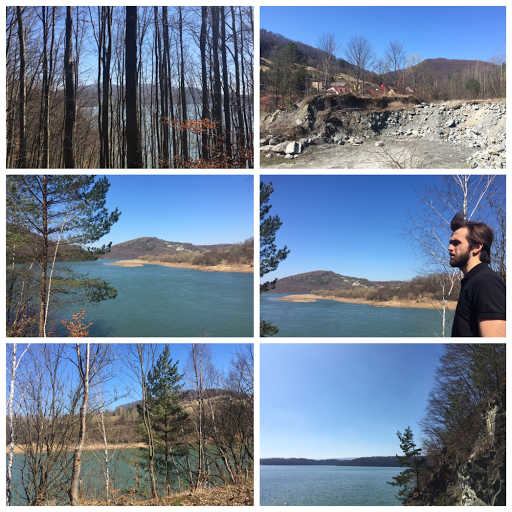 He drove us to Lake Solina which is surrounded by the Bieszczady mountain range. Piotr actually visited with his family in the summer of last year and he sent me some postcards of the views then and I do remember thinking I'd love to see it for myself one day. Well, somehow he knows me so well that he took me during this trip. It's not a natural river, it was created during the construction of the Solina Dam in 1968. It's actually the largest artificial lake in Poland and is home to some beautiful mountain scenery. We visited when it was out of season so it was more or less dead, with barely any stalls open, which was a good and a bad thing. It was lovely to have the place empty and ready to explore, but it was a shame to not use a cafe and get the whole experience. The water was a lovely clear blue and seemed to stretch on forever, surrounded my nature.